No one understands the appeal of a large and luxurious hatchback better than the average big city dweller. There's just no space on our roads and driving a big car seems a daunting and unpleasant task in the urban jungle. That's where the premium hatch steps in, offering all the luxury and toys from more expensive cars with a city-friendly form factor while still being large enough for a small family. We've lined up three cars here that offer exactly that recipe of convenience, practicality and luxury, each at the Rs 10 lakh price point. 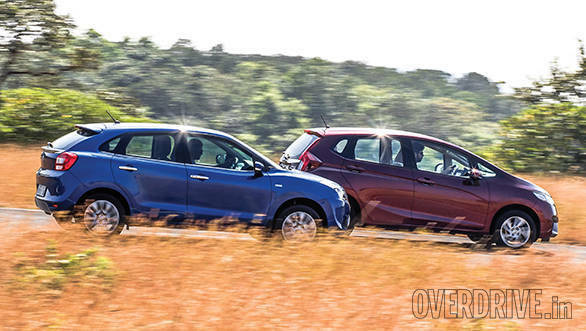 The Elite i20 has been dominating the segment for a while but Honda's Jazz has been selling well while the brand new Baleno aims straight at the Hyundai's crown. The Baleno has a striking design, I see a bit of Mercedes in there (SLS-inspired headlamps and a swoopy A-Class-like boot). This is the only car to offer projector headlamps and they have a strong throw of light while the daytime running lamps are an eye-catching touch. There's a lovely flow to the window line along the side and the rear looks rather sporty. The only eyesore to me is the chrome finish on the tiny lip spoiler on the boot. This is otherwise a very handsome design that grows on you considerably. The windows on the top model get a tint that works well but tends to attract cops who assume it's an illegal aftermarket addition. 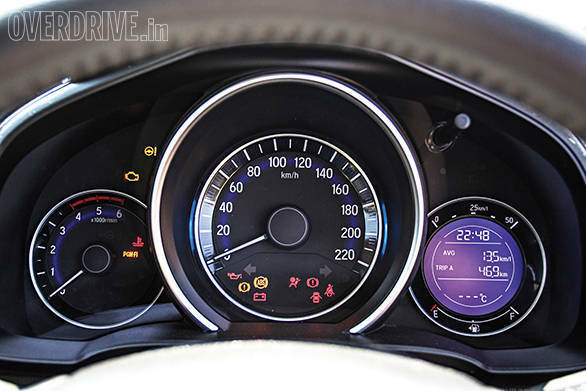 The dashboard layout follows Maruti's new liquid flow theme seen on the outside and seems inspired by the grille. It's simple but well executed and is dominated by a big central touchscreen which now supports Apple CarPlay. Android Auto support is planned for the near future. This is the only car to feature an auto-dimming inside rearview mirror, a very useful feature. 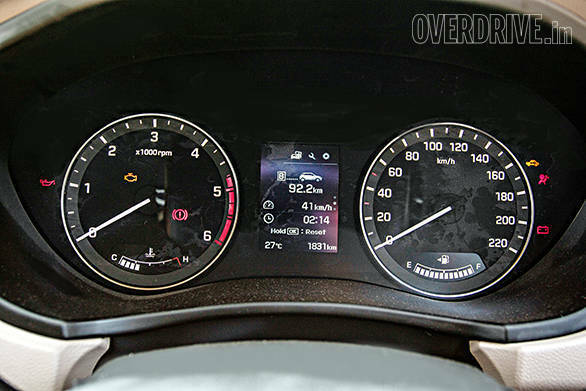 The instrument cluster gets a full-colour readout for the multi-information display. It looks rich and even has a separate menu for torque and power outputs aside from the regular fuel consumption, trip and driving time data. The Baleno has a very spacious cabin. It has the widest rear seat and very generous kneeroom. The sloping roofline eats into headroom a bit but anyone below six feet should be comfortable. Rear passengers have access to a charging point but there is no AC vent. 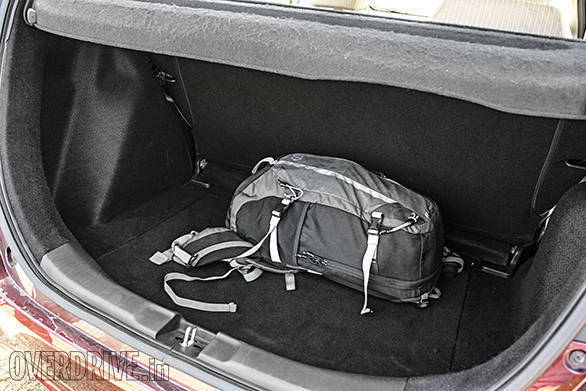 The 339-litre boot is large but deep and not as easy to load as the Honda's. 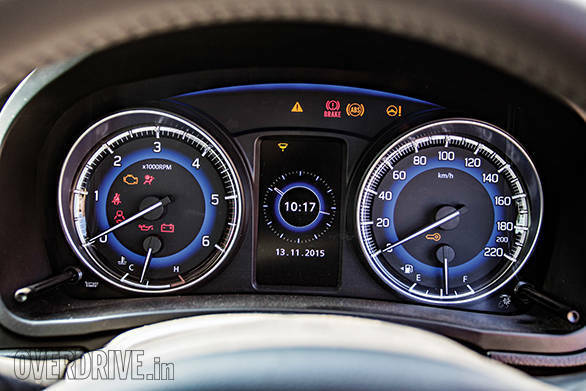 Overall quality feels good and the Baleno feels more premium than the Ciaz. The Jazz is the more youthful, extroverted design here, especially in a bright colour. It has an aggressive face, strong character lines across the side and I really like what Honda has done with the tail lamps. 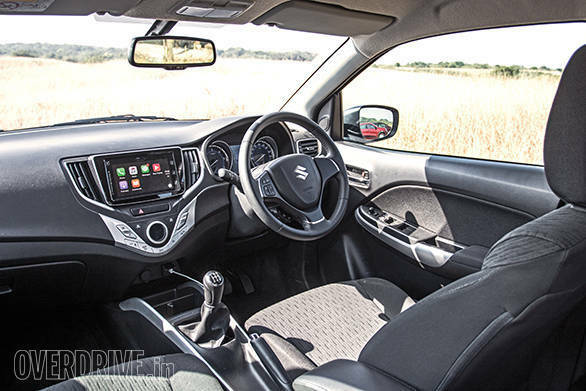 The interiors are reminiscent of the City and are smartly executed with the top end variant getting a large touchscreen display which sits above a classy touchscreen panel for the aircon controls. 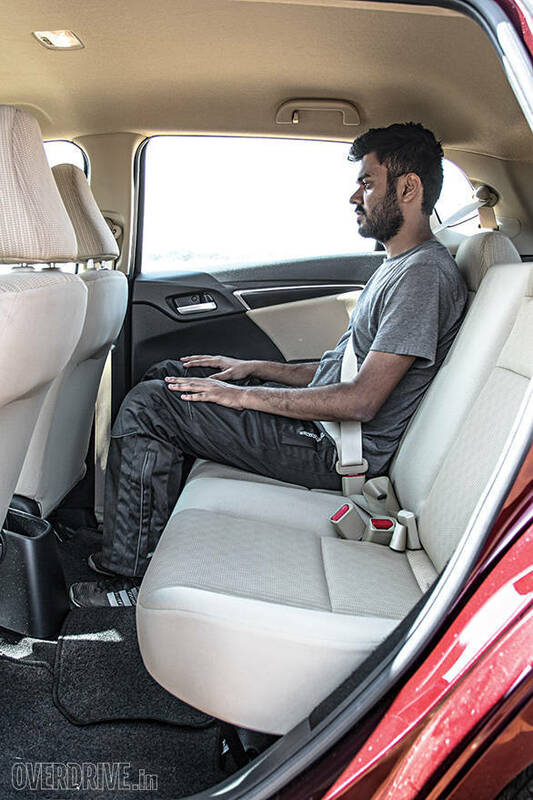 The car we had for test was the second highest V variant which doesn't get the large touchscreen or Jazz's famed magic rear seats that offer a lot of flexibility to open up the rear loading space. However, the touchscreen unit is similar to the one in the Mobilio and feels aftermarket and not quite as crisp as we'd like. The smaller unit in the V grade offers more ways of viewing the rearview camera, allowing you to zoom in or view a wide angle. No magic seats also means no 60:40 rear splitting seats. 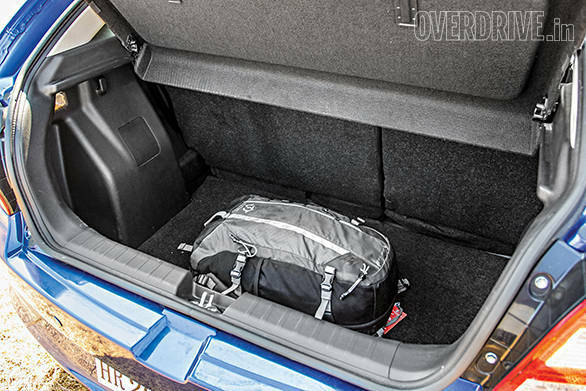 The Jazz is the most spacious car here, with the most rear knee room and a very large 354-litre boot that has a wide aperture, making it easy to load. It doesn't have a rear AC vent or charging point or even a front armrest. 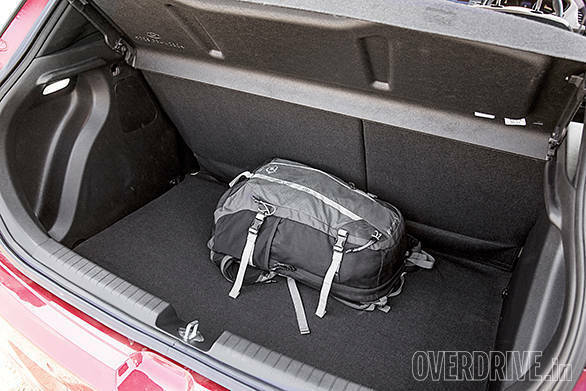 Instead, the car is full of storage spaces and like the other two, it has spacious door pockets that can hold a 1-litre water bottle. In typical Honda fashion, the seats feel flat and lack under-thigh support and I also found the front headrests are angled a little too far forward for comfort. The materials used in the cabin feel nice to the touch but our test car, which hadn't run a lot of miles was rattling at a couple of places in the dashboard. You get accustomed to it, but this is a slightly less comfy and well-specced cabin. The Elite i20 has been around for a while now but it still cuts a very chic and European shape. 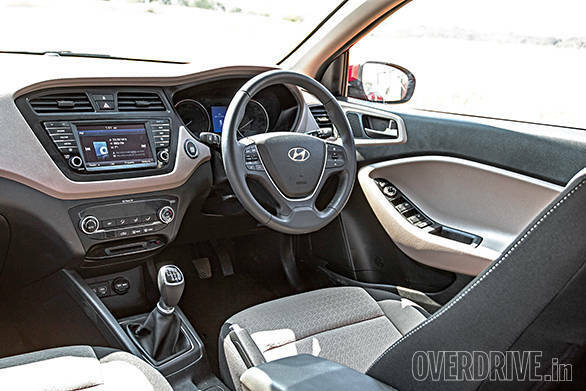 Inside, it's the i20 that feels the most premium. You'll read the same thing with the Eon in the Renault Kwid comparo that you will find in the December issue. Hyundai consistently manages to provide a level of quality with its materials that very few manufacturers can match at similar price points. The i20 has some nice features like a cooled glovebox and rear aircon vents. 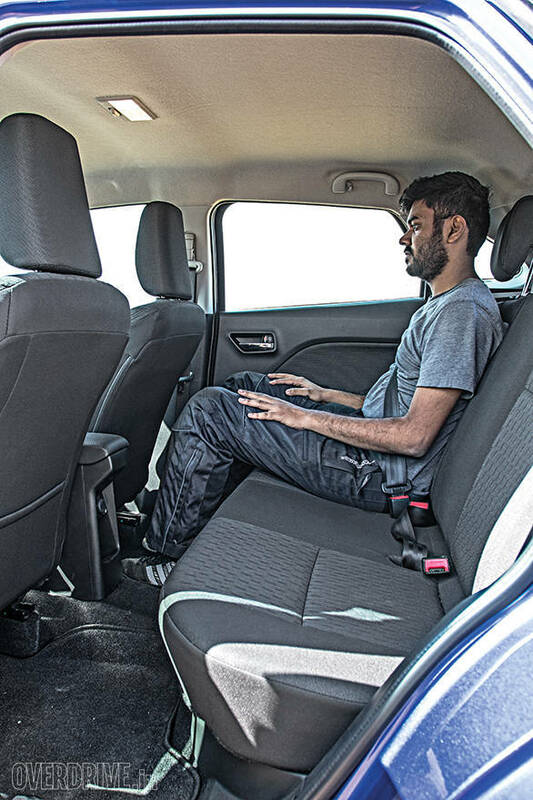 In isolation, the i20 has a reasonably spacious cabin, but it is simply outdone by the other two in rear seat space and comfort. Even the boot is a considerably smaller 285 litres. I have another grouse with the top end Asta(O) trim here. This car gets the new touchscreen infotainment system which works fairly well. The issue is that since it displays feed from the rearview camera, the company has dropped the electrochromatic rearview mirror which used to do the same job. That makes the day/night function manually adjustable while the lower Asta trim and even the top Grand i10 and Xcent models get an auto-dimming function. Quite regressive that. 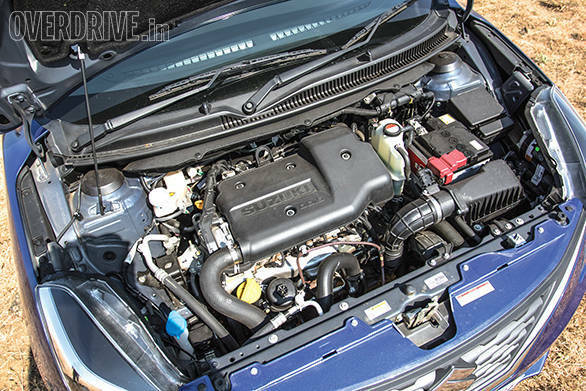 On paper, this is where the Baleno slips  the same old MultiJet workhorse with just five gears and not even the 90PS version. This engine is starting to feel its age and can sound rough and loud in some cars. The good news is that the Baleno has some of the best noise insulation we have experienced in a Maruti product and NVH levels aren't the problem I anticipated. Mainly, however, the question arises whether 75PS is good enough value in a R10 lakh hatchback. Let's consider the numbers  a 13.2s run to 100kmph makes it 0.7s and 1.8s slower than the Hyundai and the Honda, respectively. That's not a very large gap and it's mainly down to the brilliant engineering that has gone into the platform. The fully specced diesel Baleno weighs just 985kg, 100kg less than the Swift. Adding 'lightness' as Colin Chapman so fondly called it is the biggest favour you can do to an automobile. It's why the Baleno isn't far off on performance and also why it offers a very commendable 18.7kmpl. At town speeds, the Baleno is a very easy car to pilot, feeling tractable and always having enough grunt on hand. On the highway, it pulls convincingly to 140kmph but beyond that, it starts to drop back. A sixth gear would have been nice to keep engine speeds lower on the highway but the five speeder offers clean, precise throws and well spread ratios. All told, the Baleno cannot match the Jazz's sheer punch but it offers adequate performance that doesn't leave you feeling shortchanged. The Jazz on the other hand has a very potent engine. The 1.5-litre engine that debuted in the Amaze was renowned for its torque delivery and this one doesn't disappoint. In fact, the six-speed gearbox matches it better and Honda has improved power delivery as well. Where the old engine used to explode into life at 2,000rpm, the new one feels more linear with a stronger bottom end. The 4,000rpm redline still feels too low but the crisp gear throw means you'll enjoy changing gears. 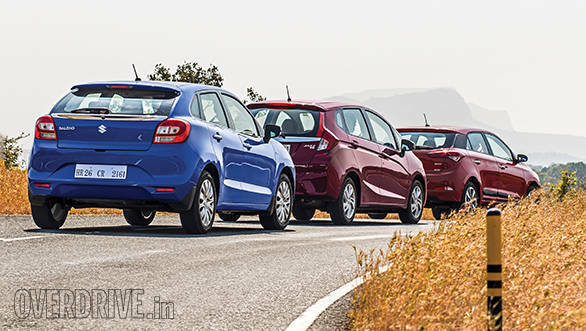 Predictably, the Jazz was the quickest, taking a brisk 11.4 seconds to 100kmph while its top speed of 170kmph is a smidge higher than the Baleno and identical to the Hyundai. The Honda engine also proves to be very efficient thanks to the strong bottom end torque which reduces the need for downshifts. Its overall efficiency figure of 19.8kmpl is very impressive. However, regardless of the figures, the Jazz is let down by its gruff and loud engine note that is apparent at all speeds. It is less refined than the Hyundai and the Maruti, despite the significantly improved NVH levels over the Brio family. Where the Jazz falters, the Hyundai shines. 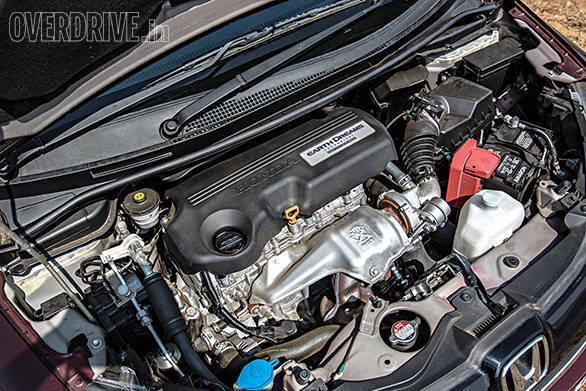 The Koreans make some of the most refined small diesel engines in the market today. 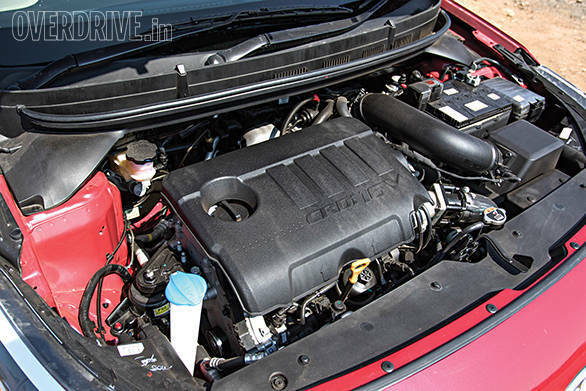 The 1.4-litre motor in the i20 is quiet enough to pass off as an engine from a much more expensive German luxury car. It's smooth and surprisingly rev happy. Rowing through the ultra light and slick six-speed gearbox, we managed a 12.5 run to 100kmph which is right in between the two. The downside with this 'malai' nature as Halley puts it is that the engine lacks bottom end grunt  ironic, given that the i20 produces the most torque on paper. It likes being revved and feels weak at low revs, probably why it is the least efficient at 18kmpl. I really enjoyed the i20 on the highway because its cabin stays quiet at high speeds but I'd rather be in the torquier-feeling Baleno or Jazz in city traffic. Maruti hasn't given us an exciting handler since the 2011 Swift. With the lightweight new Baleno platform, I was hoping we'd have another firecracker but the company appears to have saved that for the upcoming 2017 Swift. The Baleno has been tuned for comfort and has a plush and absorptive ride quality. It feels better set-up than the Ciaz but when you start to get on it in the corners, the Baleno feels soft and begins to understeer. The steering on the car is fairly direct and feels a little heavier than the other two, but in a good way. It gives the driver some feedback but doesn't feel unnecessarily heavy in traffic. I was impressed with the Baleno's straightline stability  it feels planted at speeds and in no way comes across as light or flighty. Road and wind noise is well insulated from the cabin, better so than the Jazz. A driver's car this is not but it is refined, comfortable and reasonably capable. The Jazz follows in a similar fashion to the Baleno. It has good ride quality and its main intention is to keep its passengers comfortable. You get the sense that the Jazz has a more capable chassis than the Baleno but its smaller 175-section 15-inch Michelin Energy tyres are designed for low rolling resistance and better mileage. The result is a car that begins to squeal and understeer in the corners as you approach the limit. Upgrade the tyres and the Jazz should be a considerably better handler, perhaps at the cost of some fuel efficiency. The Jazz isn't an exceptional driver's car, just like the Baleno, but it's not as comfortable because of the road and wind noise that tends to seep in at speeds. Still, it's a very big step ahead from the loud cabins in the Brio family. It sounds almost strange to say this but the Hyundai is the most dynamic car here. 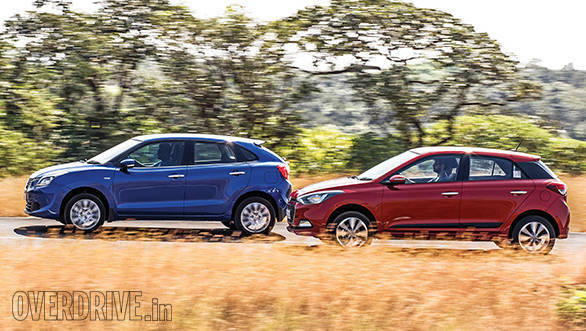 The i20 chassis is set up a little stiffer than the other two but the small sacrifice made in ride comfort is offset by the gains on a winding road. The i20 hugs the road much more resolutely, it has much less body roll and despite the fact that it runs the same sized Apollo Alnac tyres as the Baleno, it is much more resistant to understeer. The difference is in the way the chassis has been set up. However, what holds this back from being a real driver's car is the perennial Hyundai stumbling block  light and lifeless steering. It's a big step ahead from the older Hyundais and feels reasonable in isolation. But compared with the other two electrically assisted systems, the i20's steering feels like a Playstation controller on the limit and offers next to no feedback. That and the super slick gearbox take getting used to and detract from what is otherwise a surprisingly involving driving experience. Choosing between these cars is quite difficult. They're closely matched and you could walk into any of the three showrooms and drive out a happy owner. All three are well-specced with features like ABS and twin airbags, climate control, touchscreen entertainment and even navigation but some are better than others in certain areas. In the quest for a conclusive end to this comparison, we shall start with the Jazz. The Honda appeals with its spacious cabin and powerful motor. It's the choice here if cabin and luggage space is your absolute priority and its funky design will charm the younger demographic. But the Honda loses out in terms of refinement and it has the least features. 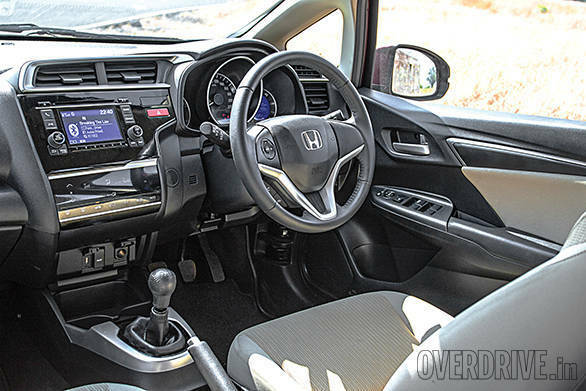 Also, at Rs 10.42 lakh (all prices on-road Mumbai), the top end Jazz with magic seats and the large infotainment screen is nearly Rs 50,000 more than the Baleno, a premium it can't justify other than the fact that it is a Honda. The lower V variant we have is priced on par with the top end Baleno. Then we come to the Rs 10.19 lakh Elite i20. I'm a fan of the Hyundai's super smooth engine and excellent NVH characteristics. It is well specced with features like a twin rear AC vent, a cooled glovebox and auto headlamps but it loses out on cabin space and boot volume. The driving experience is polarising, some may love the handling edge but others may not be able to come to grips with the steering feel. It's a very nice car but simply doesn't offer the best value any more. Finally, the Baleno. I thought the engine would be a deal breaker but after having spent a week with the car, I'm confident the Baleno can carry itself well in this company. It scores with a very spacious cabin which is very nearly on par with the Jazz. What started with the S-Cross now continues with the Baleno  Maruti is giving you the richest feature set in the segment. The Baleno is the only one here with height adjustable seatbelts and has ABS and airbags standard across the range, which is a huge plus point. It also gets those excellent automatic projector headlamps and a crisp full-colour multi information display as well as the touchscreen infotainment display that supports Apple CarPlay. And then there's those unique, head turning looks. 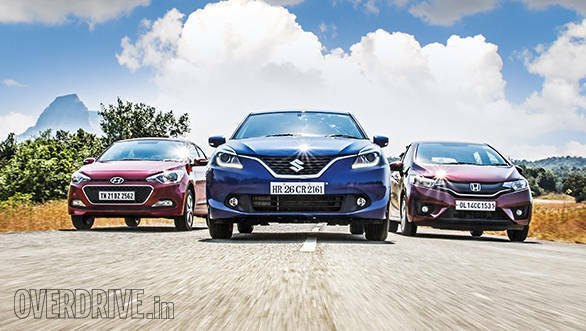 Most of all, Maruti has learnt from the S-Cross and the Rs 9.88 lakh Baleno presents a Nexa experience that doesn't cost an unreasonable amount of money. The Baleno is our new king of the premium hatch segment.